I have a great lineup of shows for April from Sydney to the Southern highlands, Canberra and Melbourne. Cambridge Markets. 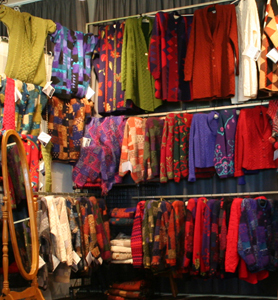 Everything from fresh flowers to organic meat, fish, vegies and clothing 8am to 1pm. The food truck line up is pretty good too! Easter Sat 20th April 8am to 3pm. Sat 11th May 8am to 1pm Sydney's Southern Highlands. texture and pattern - what fun! 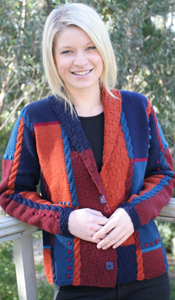 Simply call 0427 064 834 or email jane@sigknit.com to arrange a time with Jane. Signatur Studio is in Ballyshannon Rd, Killarney Heights NSW 2087. 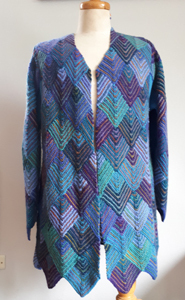 Above: Shaker Jacket with short row shaping into the front hemline and pocket detail, this also has a new neckline a notched shawl collar in the front in addition centre back of the collar. The back has buttons from the hemline up. This colour is Stone and is finished with shell buttons. On most colourways the back will feature triangle buttons and square handmade on the front. 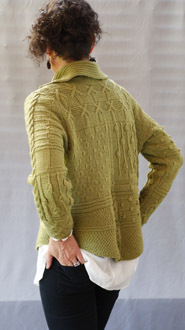 Below: Coco Slub Jacket is a revised and rewritten pattern, now available in a longer style than shown below right. Finding an Italian spun 6ply variegated wool blend is the key ingredient to garter st Mitres, and creates a lighter, softer drape compared to the A-line. Metro A line coat left the original round neck style, the pattern has 7 chest sizes and 3 length options. 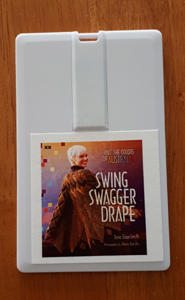 Right the Bee Bee Jacket is a blazer style (not in the book) NEW Vee Shawl neckline option for the Metro A line (book) shown in Wine and Aubergine - a simple change to the fronts really. Left Penny Jacket, keeping it simple with cables and pockets. 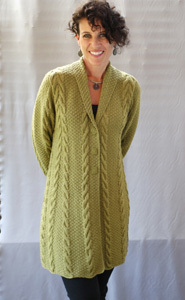 Right Diamond Cable Swingcoat, with the Vee Shawl Collar option. 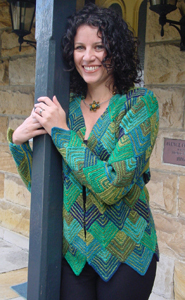 Below with round neck with Collar and fringe. 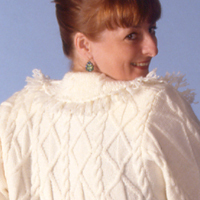 Right: Cables and stitch pattern on the back of the Zig Zag Swagger, knitted in Cream. Below Right: Knitted in a two tone option, collar and cuffs offer the contrast. Below Left: Byron A line - lots of stunning textures on the back, fronts and sleeves, lovely deep pockets. Centre Split Texture Jacket, with some of my favourite stitches. The easiest way to check what patterns are available is to go to the horizontal navigation bar and select A-Z Design Index then, to order a pattern, you still need to select a colour (this is an old website and pattern option was added later) so one needs to pick a colour for single colour designs by clicking on the rainbow, for mutli colour designs just click on the colourway image. 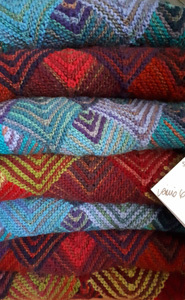 If you buy a pattern and decide at a later date you want the knitting kit the cost of the pattern is deducted from the price of the knitting kit. This is st-st (stocking stitch) 2 rows and R.st-st (Reverse st-st) 2 rows = 4 row repeat, creates a look and elasticity of a rib. This can also be called a mock rib. I use it a lot - take a closer look. Left shows a simple Circular Cowl - it looks like garter stitch until you look closer. I use this in many hats and wrap accessories. A UFO in hand knitting acronyms is an Unfinished Object, invariably waiting for the front bands to be picked up and buttonbands and neckbands which then complete the garment - and it's easy to get any of them wrong! The simple solution is to find a stitch pattern that allows you to knit the front band at the same time as the fronts of the garment. CG - Corrugated garter creates the look of a rib, but is knitted with the front bands of the garment. I widen the CG, thus taking in more stitches, so it's the width of the collar. Then, when the collar is worn open the stitch pattern continues without a pick up row and ugly transition. The styles below all show the round neck style with collar. the Ruby Swagger (left - extra long). Out of print as a book! 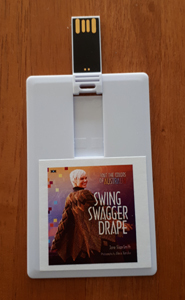 NOW on a UBS stick! Simply slide into your computer, see every page of the book, print out just the pattern you need! mum or BF a kit! NEW GOMILOTO 8ply in 50g balls, finally a Pure New Wool in this style of yarn, dyed as fluff before spinning, so when spun long lengths of colour drift through the knitting. 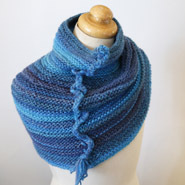 Below left to right: Azteca Fine Circular Cowl in Washed denim. NEW design Two The Point scarf in Peachy Pink. NEW Muffin Top Hat. The Yurt hat style in Azure knitted in the orginal thicker Azteca. If you'd like to discuss anything in this newsletter - or anything at all, please email Jane. 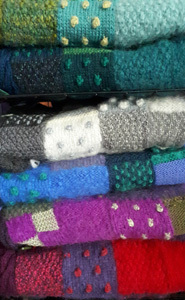 Thanks for your support - Laura, Petra, Philippa, Cathryn, Helen, Margaret and I look forward to seeing you in the knitting circle!